Blend together all ingredients except the Bananas. When fully blended, then slowly add pieces of cut up bananas to gently blend and smooth together. Cherries, blueberries, chopped nuts, seeds or desiccated unsweetened coconut are great additives for crunchy flavorful taste. When using Fruits, you exchange Vanilla Flavoring for Fruit flavoring - i.e. strawberry flavoring with strawberries, etc. Freshly created frozen dessert will have the consistency of Carvel - soft Ice cream /custard, after freezing it will have the consistency of ice milk. Abstain from indulging in the unhealthy food combination of protein (cheese) with grain. Original Pizza was simply grilled fresh vegetables on pizza dough. 1/2 cup whole wheat pastry flour (add up to 1/4 cup flour as necessary while kneading. Sprinkle the yeast, kelp, honey and oil over the warm water and allow the yeast to foam. Stir in flour, knead for about ten minutes, allow to rise until double in size. Roll dough out to fit a pizza pan or cokkie sheet. Lightly saute onions till crisp and lite yellow. Gently spread tomato sauce on pizza dough, add all vegetables and tofu; gently brush olive oil over topping and season to taste with garlic powder, kelp and cayenne pepper. Bake at 350 degrees. Blend all ingredients together, spread on large non-stick cookie sheet and bake at 350 degrees for about 30 minutes; allow to cool then seal in glass jar. Pre heat oven to 425 degrees. Clean Eggplant and punch fork holes. Place in small glass baking or roasting pan with about 1 inch of water; bake for 1 1/4 hours. Allow eggplant to cool a little, peel and scoop soft eggplant out and place in a bowl, stir till mashed. Add tahini, tamari, and tofu, mix thoroughly; add tomato, pepper and lettuce, mix then add seasonings. Increase with small amounts of tahini and tamari for flavor and moistness. 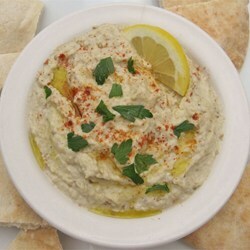 Serve on either Pita bread, stalks of celery, or crackers. Great alone or with soup. If using cashews, make base by carefully blending in small amounts of water till slightly smooth. OR, a better choice is Nayonaise. *Be certain to remove banana skins, place peeled bananas in plastic bag, remove air and freeze. BLEND together all ingredients except bananas. When blended, slowly add bananas. Don't overload blender. Pour into freezer container or enjoy and eat immediately as a soft frozen "ice cream." On low heat melt Ghee then remove from heat; sift Flour& Baking powder - set aside; add Carob and Maple syrup to Ghee, beat and blend mixture; add Flour to Carob mix, add beaten Eggs and blend in Vanilla and Sunflower seeds. Place mix in glass 8" square pan. Bake in 350 degrees preheated oven; bake for 30 minutes. Cool and cut into squares.